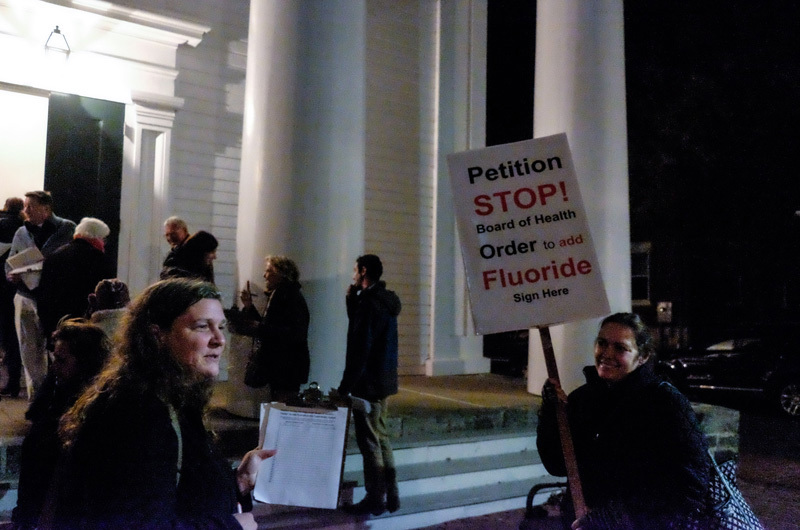 I am writing in response to the recent Edgartown board of health’s move to add fluoride to our municipal water supply. I am not inherently anti-fluoride. I use fluoride toothpaste myself and use it on my daughter. I am not conspiracy minded; I vaccinate, I eat non-organic blueberries, and I am glad to avail myself of modern medicine’s many benefits. It’s also rare for me to stick my neck out about issues in our small town. But I am moved to comment on this debate because I am deeply concerned about the unaddressed questions of efficacy, necessity and safety, as well as the lack of information provided by the board of health to allow voters to make an informed choice when it comes to adding fluoride to our water supply. Proponents of water fluoridation cite the Center for Disease Control’s statistics that it can contribute to decreasing the incidence of cavities by up to 25 per cent. However, a 2015 meta-analysis from Cochrane Oral Health Group found that of 107 studies on community fluoridation, 97 per cent were flawed in their methodology or bias, with an additional lack of sufficient information on the differences in cavity incidences between poor versus affluent populations. In addition, almost all of the studies were conducted prior to the widespread advent of fluoride-containing products, so the authors concluded that the data are not relevant to contemporary lifestyles. Fluoride in the water may become just like one of the other in-hindsight-we-know-better issues — like cigarettes, or DDT, which you can ask our osprey about, or sun exposure, or any other area where knowledge gained with time changed our understanding. So Edgartown residents should think carefully about approving this measure. Fluoride advocates argue that fluoride is a necessary addition to water and is much like fortifying orange juice with calcium or salt with iodide. In fact, fluoride has never been classified as a required nutrient for any physiological function. It is also a false equivalency to compare water fluoridation to fortifying foods, because orange juice is not a necessity for life in the way that water is, and consumers can vote with their actions about whether to consume it or not (unlike water). Nor is fluoride required for life the way that a vitamin is. Adding fluoride to the water raises questions about controlling for proper dosage and about waste. Drinking water is a tiny fraction (an estimated .5 per cent of total water consumption — comparable to drinking six drops from a gallon), while most water goes straight down the drain and back to our single-source aquifer. Island board of health authorities cannot even tell us how much water any person should drink to get an optimal amount of fluoride, and cannot say how they propose to ensure that any of the target audience for this measure are drinking the water. In addition, they aren’t able to tell us how to avoid over exposure by controlling the dosage of fluoride in our water in relationship to the fluoride that is available elsewhere — in dental products, but also (in small but cumulative quantities) in our food from fluoride-based pesticides such as cryolite, used on a wide number of fruits and vegetables. The fact is that fluoride is readily available elsewhere and adding it to the water supply is redundant. Those who support water fluoridation claim that it is completely safe. Yet for every study of its safety, another study disputes it. Supporters argue that if fluoride was harmful, the majority of Americans would be suffering from its effects, but that is a gross oversimplification of how epidemiological studies work. Masters and Coplan in the International Journal of Environmental Studies found that there are statistically significant blood lead levels in Massachusetts communities with fluoridation compared to those without. The National Institutes of Health’s peer-reviewed research shows that any positives of fluoride come from topical application, and any negatives come from ingestion. Also, fluoride’s anticavity effects are “critically dependent on calcium and magnesium content of teeth enamel. Among young individuals with low calcium and magnesium in teeth enamel (usually due to undernutrition), fluoride ingestion . . . may paradoxically make such individuals more vulnerable to dental caries.” In other words, the population that the board suggests this measure is targeting, the low socio-economic class (with the troubling implication that in those families no parent is monitoring their child’s nutrition or brushing their teeth), is the same demographic that may be most negatively affected by fluoride. These are not insignificant voices questioning the benefits of fluoride in the water. When it comes to public health interventions, the burden of evidence must be much higher than is currently offered for fluoridation. The Edgartown board of health has failed to provide specific or concrete information that would help voters make a clear and informed decision. No actual information about cost has been disclosed beyond an initial estimate of $640,000, nor has an answer to the question about which kind of fluoride they plan to add to the water been given. Edgartown water is the envy of water managers everywhere. My father was the Edgartown Water Company manager for 18 years, so I grew up visiting our pumping stations and learning about our pristine water system. Town residents already have a choice; fluoride is widely and cheaply available for those who want it. Edgartown voters should vote no on question six and instead support other efforts to equalize access to dental care and good nutrition. Brilliant, and not just because she's my daughter.